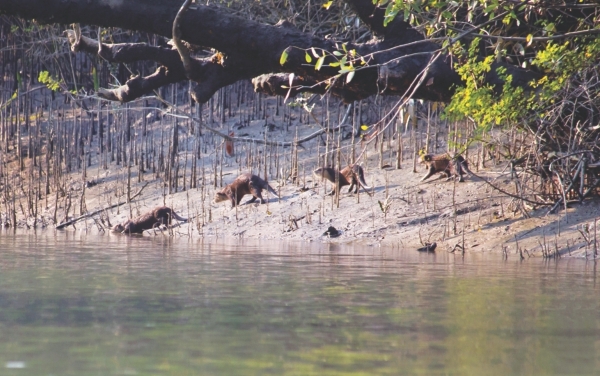 One would think that a forest as beautiful and mysterious as the Sundarbans would have a rich entourage of books detailing its biodiversity, natural beauty and touring information. 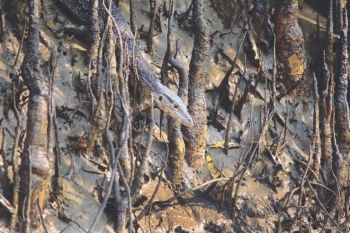 But sadly this is not the case and it is what prompted Ihtisham Kabir, a passionate photographer and newspaper columnist, to bring out Sundarban-A Photographic Journey. Being a compulsive photographer, Kabir takes pictures of everything - birds, landscapes, streets and people. Undoubtedly nature has precedence in his list of most photographable things and the Sundarbans is a perfect target for capturing untainted beauty on lens. Deer alone: view from visitor's tower at Kotka. Monitor: a water monitor (gui shap) playing on the bank of the canal early morning. 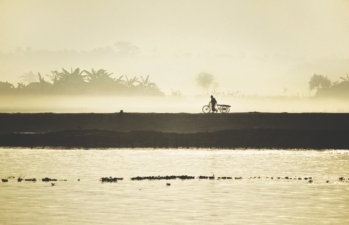 Cycle: view from the launch approaching Sundarbans. The pictures in this book indeed give an idea of just how gorgeous this forest is and how little we know of it. 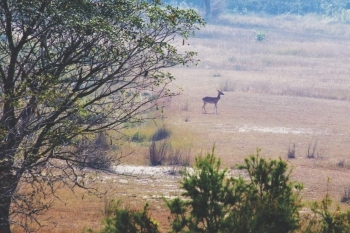 Apart from the postcard scenes of a river surrounded by lush greenery that take 'unexpected forms and shapes' as Kabir puts it, there are pictures of the well known and unusual creatures that inhabit this enchanting forest. The section on Birds and Wildlife is truly the best part of the book and offers the obvious reasons for tourists to visit. While spotting a Royal Bengal Tiger, an ambitious yet not impossible dream, there are plenty of other birds and animals that make fascinating viewing, albeit with a certain amount of patience adds the author. And patience is a prerequisite for wildlife photography. There are adorable poses of brilliantly coloured kingfishers - different kinds - as well as lesser known birds such as the camouflaged hoopoe that walks around open fields looking for food. A Brahminy kite in flight, the rope-like vine snake peeking out from the branches, a clawless otter family going for a dip, a mudskipper taking on the colour of the land it lives on... All the pictures have detailed captions that offer information on each bird or animal along with sometimes the particular circumstances under which the picture had been taken. An excellent story teller whose crisp, lyrical writing is a pleasure to read, Kabir also tells stories to further illustrate the imagery. The section titled 'Forests' takes the reader deep into the forest with an account of what it feels like to walk through the paths and breathe in the heady air and experience the wild beauty of mangrove roots shooting upward from the ground to enable the trees to breathe when they are submerged by frequent floods and tides. Sometimes the images are like paintings such as the picture of a dead tree trunk floating on the water with its reflection perfectly captured by the photographer's lens or the photograph of a tree growing sideways over the water. The last part of the book named 'Visitors' gives practical information on what kind of trips and facilities are on offer for tourists. Perhaps the only criticism of this obvious labour of love is that the formatting could have been more professionally tailored to accommodate such lovely pictures. The white spaces on the top and bottom of each page are distracting and take away from the lavish quality of each image. 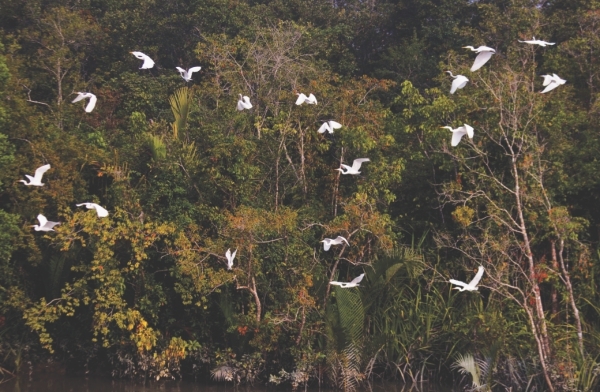 A flock of great egrets on shela river. With electrical engineering degrees from the most prestigious universities in the US and a career as a software engineer in Silicon Valley, photography and writing seem to be unlikely pursuits for Kabir. But they have always been elements itching to surface only to blossom when he came back to Bangladesh. Kabir's weekly column 'Tangents', which comes with photographs and the stories behind them in The Daily Star, gives a preview of the avid interest that Kabir takes in Bangladesh, trying to extract all that is positive and extraordinary and project it to the world. 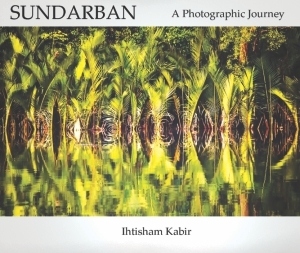 Sundarban-A Photographic Journey is a poetic narrative of the writer, as he takes a boat journey into this forest and experiences its ethereal beauty urging the reader to turn each page to follow his trail. The book is available at Aranya, Bookworm and the Omni bookstore at Hazrat Shahjalal Airport.